This month’s ‘Family Tree Magazine’ (UK) has a piece I did about crafts in eighteenth and nineteenth century asylums. 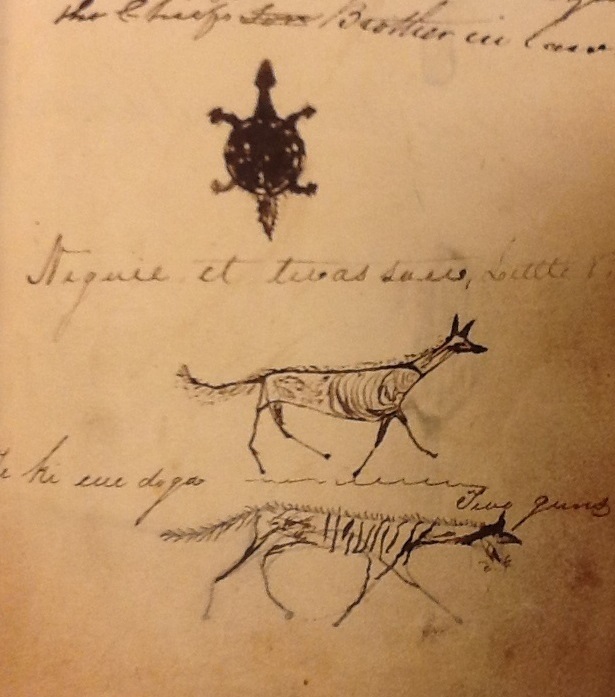 Whilst researching, I stumbled on these amazing Native American autographs, in The Retreat’s ‘Visiter’s Book’, made by visiting Seneca nation dignitaries, in 1818. Couldn’t shoehorn them into the piece, so here’s one for all of yous out there who love this stuff. I hope to be getting back to the Thackray Medical Museum in Leeds, very soon, to do some more research on the amazing Lorina Bulwer’s craft work, and hopefully will be evolving some workshops for those of us who want to learn to rant via the medium of embroidery. Gentle Reader, join me in the pages of Family Tree Magazine and find out more about our ‘insane’ ancestors and the way they used crafts for therapy, venting, and sometimes simply to pass the time. Asylum records (where they exist) are an incredible resource for both historian and genealogist. In areas like Yorkshire and Lancashire with a rich textile industry heritage, you can find amongst those committed; spinners and weavers, mantua-makers, milliners and tailors, knitters, mill-owners, husbandmen and farmers. To find out more, read this month’s ‘Family Tree Magazine’ (June 2014). Available at all good newsagents, etc. This week, I’ve mostly been spinning gansey yarn. Here is some of it on the clothes horse. It’s been washed and is dried unweighted. That is the extent of ‘blocking’ for knitting yarn. Why is commercial guernsey yarn always 5 ply? Because guernseys came about post Industrialisation. By the 1820s, most yarn in England was machine spun. The Spinning Jenny had already been superceded by the Water Frame. Handspun was less common, although some 20thC Dales knitters recalled their grandmothers spinning for home use but they are often talking about small things like stockings and gloves rather than the ‘Popped Uns’ (jumpers) and ‘jackets’ they contract knitted for mills. So 5 ply guernsey yarn was firmly a product of the Industrial age. Machines liked making singles of a certain grist (fatness) and 5 plies of those singles made the perfect yarn for knitting guernseys. Other yarns made from the standard singles included 3 ply, 4 ply and double knitting. There is no real reason for guernsey yarn to be 5 plies, but it might be better at more than 2. There are structural differences between 2 and 3 ply yarn. I decided to go with 3 plies for my handspun. That gives me good stitch definition due to 3 ply having a more circular cross-section than 2 and also a bit more wear and strength. No need to go up to 5 plies as it would never have been done historically: too much labour expended at nearly double the time to spin 5 singles as opposed to 3. I decided to match my yarn approximately to Frangipani. It’s a nice grist; not too fat. I wanted a slightly higher ply twist, though. I used iSpin Toolkit for all my calculations re. wraps and twists per inch and their handy calculator for ply twist to get a balanced yarn. First time I have used it and found it extremely handy. Will be using it for all my projects! But this is the pronouncement of someone who has never seen ‘the old Fisherman’s wool’ or rather, the extant ganseys made from it. 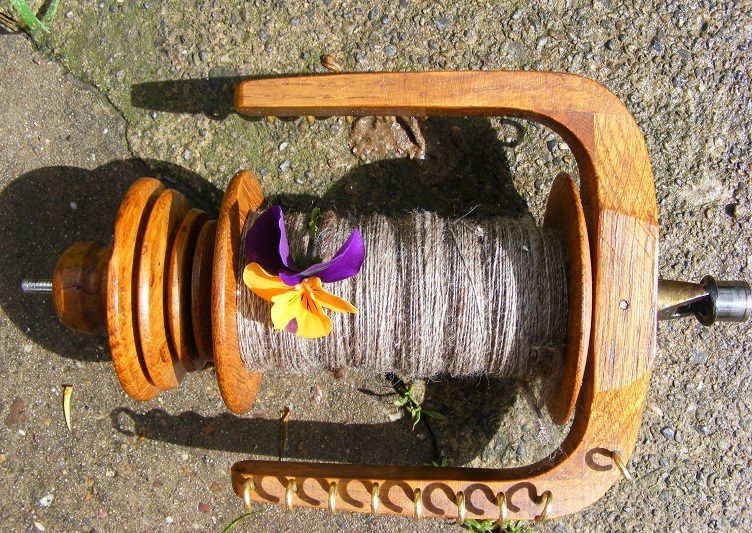 In fact it often strikes me as being fairly tightly plied. And, just to confound the theory that a looser ply makes a more ‘waterproof’ fabric with extra integrity therefore those ganseys were used for fishing… oddly the opposite is true: ganseys I have seen that appear to be made from a slightly ‘woollier’ yarn, plied a bit looser, are often the grey ‘Sunday best’ ganseys that were never worn to sea. The ones worn to sea often have a sheen and patina, gaps between the stitches, and stitch definition like you wouldn’t believe, from the fact they are plied tightly. Oilskins existed, of course, so no need for a totally ‘weatherproof’ fabric. Now the art in handspinning gansey yarn is to accentuate the lustre and the fact you’re preserving the length of the staple – at the same time, not to produce leaden, lifeless looking worsted. Fine spinning is of no interest to me as a rule as I want to spin for knitting. And I don’t enjoy lace knitting. The big question is: how long would it take to spin the yarn for a gansey? Bear in mind most of my spinning, 95% of it, is wool spun longdraw or silk spun semi-worsted from the fold. And for a gansey you need a short, forward draw (for true worsted). one can easily spin and ply 400 yards of gansey yarn in 8 hours, so 30 to 40 hours of spinning time is a very reasonable estimate for total spinning time for the yarn for a gansey. Only I’m afraid to admit, I failed to meet the Blogger’s exacting requirements as I found I couldn’t spin a skein of gansey yarn in 8 hours. 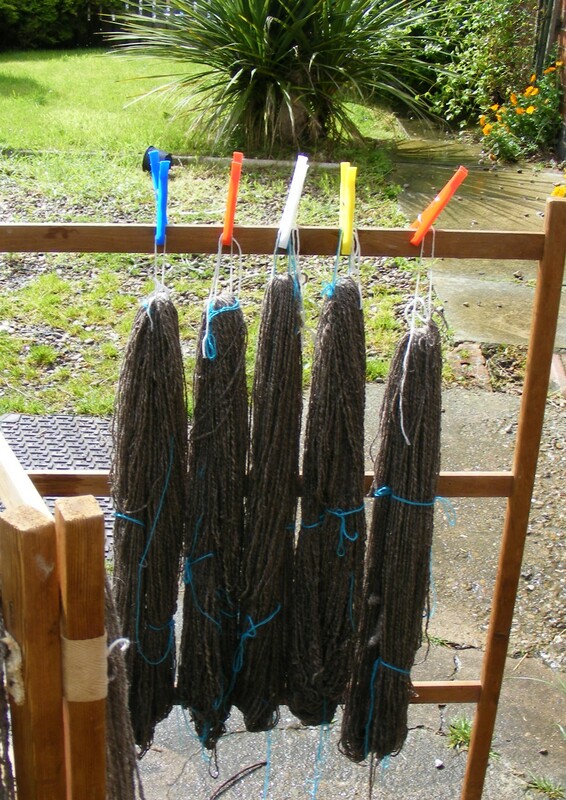 Admittedly 3 ply not 5, but I have discovered I can easily spin 100g of BFL into 3 fine singles of gansey yarn in…. 75 minutes. Am left wondering why our Hero is so slow, when he has spent so long pimping his wheel? I’m using a TT Chair Wheel as it came to me from Mr Williamson in 1998. Admittedly, it’s not an entry level wheel . So you could probably pimp a “Traddy” til you were gansey blue in the face and still end up with a much slower wheel than a Lendrum Saxony or some models of TT, or many others, as they come to you from the workshop. Maybe someone should tell him. …modern wheels all have a very narrow envelop [sic] of performance design standards. Is that because they go as fast as is mechanically possible? No, it is what the group wants, so everyone can spin the same yarns at the same rate. insults wheelmakers, who are fellow craftspeople as well as spinners. According to this person, spinners (that’s you and me!) are divided into ‘Boss Cows’ and… cows. Nice, eh? And the whole herd is part of some kind of evil conspiracy to keep wheels slow. These are the words of someone who has only owned a nice, but mass produced, entry level wheel and makes the mistake of judging every other spinning wheel on the market, by the standards of the only wheel they have owned. It also shows deep ignorance of old wheels as they are essentially no different to our modern ones. I think we’re looking at some profound misogyny here, with all the references to cows and Victoria’s court and hobbyists. For ‘hobbyist’ read: ‘female’. A preliminary scout about in a spinners’ Rav group suggests that quite a few of us routinely spin considerably faster than the Blogger. And even when we’re not trying to “race”. Check out YouTube video of Abby Franquemont spinning on a Lendrum Saxony, to see fast – but relaxed – spinning. Slow wheels have their place, too. I have days when I prefer to spin on my Timbertops Lonsdale. So I spin on it. I am not denigrating slower wheels. Spinning is a joy, not a chore. Our Hero plies loosely but I am the opposite and ply pretty tightly with a fair few twists per inch which slows down the plying process considerably. Even so, I am spinning in minutes what he appears to be able to produce in hours. And that is consciously going fast but by no means going flat out… I am not a particularly fast spinner, compared to many others. It is not something I have ever cared about, or focused on. Other spinners go faster than me. If you are a competent spinner, you can spin the 5-ply needed for a gansey in 30 or 40 hours. The spinners that have been spinning for 30 yeas [sic] should have gotten busy 25 years ago and developed those skills. I’d just say: don’t make assumptions about craftspeople. Or denigrate them. 30 years is, coincidentally, precisely how long I’ve been spinning. And without any wheel modifications, and not much effort to consciously ‘go fast’, I can more than half the vaunted spinning time. Many experienced spinners will be faster than me. My approach to learning to spin the impossible worked. Their criticism would only have validity if they were much better spinners than I am. Show us the yarn. Show us that you can spin a full hank of 5-ply sport weight in 8 hours of spinning. If you can’t do that, then you do not have the moral authority to criticize me. To be honest, in 8 hours, I could spin 3 skeins of guernsey yarn to his 1. Better, faster… and cheaper. That said, I’d give no credence to the idea that speed = good spinning. But just wanted to deflate the windbag and his offensive assumptions. Anyone familiar with The Blog will know that whatever the Blogger is currently doing, becomes the yardstick by which others must be measured and found to fail. Apparently no-one’s opinion on weaving is valid, unless they have woven ‘a bolt’ of ‘woolen shirting fabric’, for example. I have 2 problems with this particular example. (i) no ‘shirting’ fabric in Europe was woollen. Shirts were always made from linen, later cotton. So there is no such fabric in the English aulnages anyway, historically. So no need for anyone to make it as even re-enactors can’t use it. 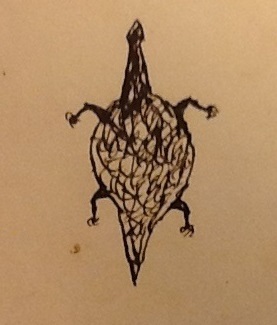 And (ii) Well… as you haven’t done it yet either, all your opinions are invalid, by your own criteria. And, all the folks who say that my analysis of history is wrong, did not manage to learn to spin as fast and as fine as I do. No. That’s true. The boss cows spin faster. Some of them finer, too. And I will try and get a thrumming video up and linked to on here, so anyone who is making the General Carleton Hat or the G Walton 1846 gloves, has a handy guide, ASAP.